Cape Region clubs and local golfers have kept busy with tournaments and other competitions, as the summer golf season rolls along. Rehoboth Beach Country Club completed its 62nd annual Men’s Member-Guest Tournament July 16. As in past years, the golfers played in ten different handicap flights. 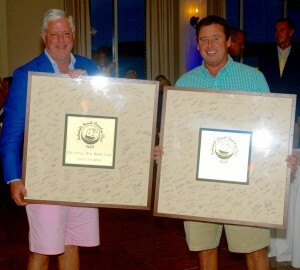 Peter Moran, Jr. and Brad Mitchell not only won the Harbour Town flight, but were also the overall winners of the event. They and the other winners were celebrated at the 62nd annual Gala at day’s end. Peter Moran, Jr. (r) and Chad Mitchell (l), overall winners of the 62d annual Men’s Member-Guest tournament at Rehoboth Beach CC. Sussex Pines Country Club held its Club Championship over the July 16-17 weekend. Garrett Fox won this year’s men’s championship, with Scott Lanham taking second. Dave Layfield in third, and Blasé Gavlick in fourth. Brenda Lewis is the women’s champion. Linda Townsend won first place gross, and Sue Brady took second in that category. Scott Baker won first place gross in the White Division, and Shawn Jones finished first net. Don Tipton took first gross in the Gold Division, and Oscar Pickenheim won the net category. Kathy Hudak took first place gross in the women’s First Flight, and Debbie Quinn earned the second spot. Madelyn Macklin won first place net. In the women’s Second Flight, Carol Love won first place gross, with Hazel Pusey winning first place net. 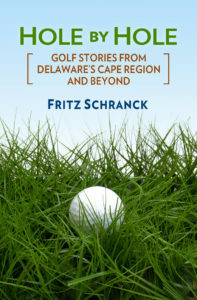 The Delaware State Golf Association has been conducting this year’s Play Golf Delaware Tour, and held a Four-Ball tournament July 20 at Newark Country Club. Cape Region golfers Judy Wetzel and Marilyn Hewitt combined to win the Women’s Division gross category. Not to be outdone, fellow Kings Creek CC golfers Sherry Pie and Ana Dittel won first place net. The Kings Creek Ladies 9 Hole golf association played their Shamble team event July 20. Kathy Nave and Jane Perkins won first place, assisted by a blind draw addition to their team. Second place went to Mary Mezger, Gail Petren, and Shirley Maloney. The Sussex Pines Ladies 18 hole group played a Mutt and Jeff Tournament July 26. In this format, only the gross scores on the par 3s and par 5s count toward the total. Townsend won first place, while Lewes took second and Carol Love finished in third. Last October I wrote a column about being fitted for a new driver, a Ping G30. My previous driver was a Ping G15, set permanently at a 12-degree loft. It worked pretty well, but my yardages were nothing special, in fact a bit short. An unusually good drive would go 220 yards, but most were in the 195-205 range. Using the launch monitor at Rookery South, golf pro Kyle Deas showed me that I hit up on the ball at impact, making this driver act more like a 4-wood than the “Big Dog” it was supposed to be. After a bit of trial and error, we settled on the new loft-adjustable G30, set at 8.5 degrees. The screenshot accompanying the column showed a drive of 235 yards, with most of the additional yardage coming from more bounce and roll after the initial landing. Since then I’ve played a few dozen rounds, and spent at least as many days on the practice range. I’m pleased to report the actual improvements in driver results are matching the predictions from the launch monitor, and sometimes better. Most of my rounds take place at the Rookery golf courses, but the longer drives have also made appearances at other Cape Region courses, such as Baywood Greens, Rehoboth Beach CC, and Kings Creek CC. Given the variety of turf conditions found at those layouts, I don’t think the improvement is coming from where I’m playing, as much as how I’m playing. The golf lessons and practice sessions certainly helped, but there’s no doubt that with my upswing at impact, the lower-lofted driver is producing much better results. The new “normal drives” are averaging between 225 and 245 yards, with the better drives going 250 or more if the fairways are a bit firm. The best so far was a 279-yarder on Rookery South’s 18th hole, with help from a following wind. Mishit drives, usually hooks into the left rough, are still finishing around 200 yards from the tee. The longer average yardages are naturally helping reduce my overall scores. Hitting a good approach with an 8- or 9-iron is frankly easier for me than a 5- or 6-iron. I have a better chance of not only reaching the green, but also placing the ball far closer to the hole. I am perfectly okay with this. Deas says other folks who have gone through a fitting session with him are also seeing the benefits. He reported that some see an additional 15 yards or more of carry, while others see a total increase of 15 yards or more. Last fall, Deas also stressed that the fitting sessions are particularly helpful for golfers whose swings are fairly typical from one to the next. Erratic swings need lessons to improve, and the launch monitor’s role is different for those folks. On the other hand, if you tend to hit your drives the same way on most occasions, a fitting session with a launch monitor can help you discover if a change in your driver’s specifications would help improve your results. Your local golf pros, and their launch monitors, are ready to assist. Congratulations to Rich Recicar for his first ever ace, made at the Rookery South on July 20. It came on the 185-yard par-3 fourteenth hole.